Speculations are rife, regarding the real reasons behind president Koroma’s decision to cancel his planned visit to the United States this weekend. 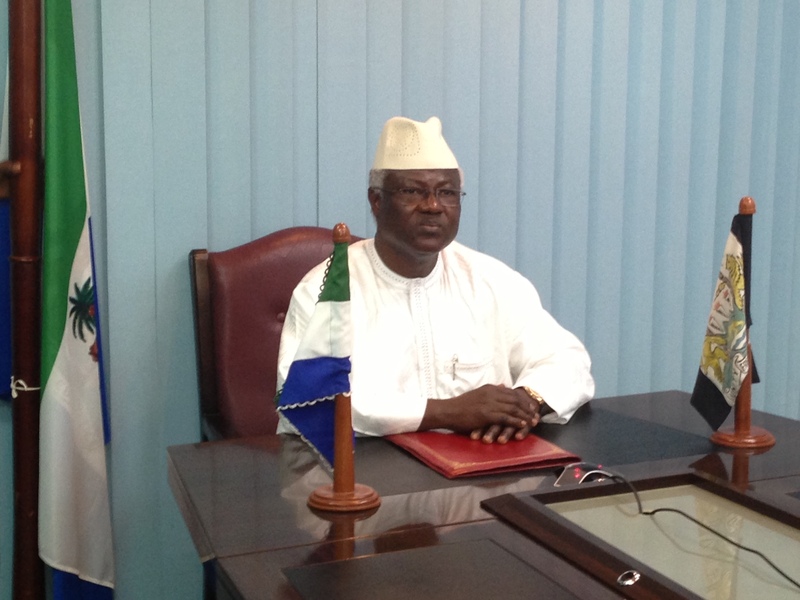 Official sources say that president Koroma suffered an ankle sprain whilst playing squash. But many doubting Thomas’s are now pouring cold water on this official line from State House. 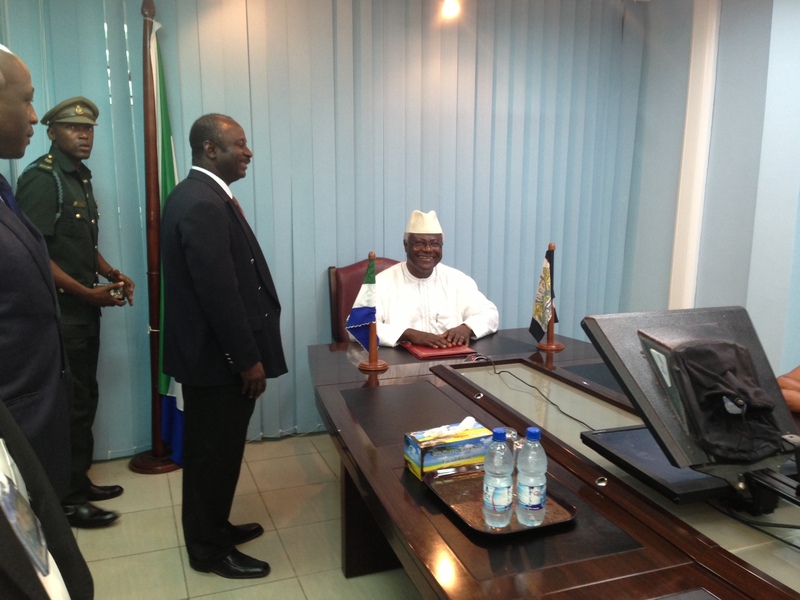 (Photo: The president at the World Bank’s office yesterday in Freetown). President Koroma was yesterday at the offices of the World Bank in Freetown, where he delivered an important speech on the role that Africans in the diaspora can play, in ensuring that the continent is less reliant on donor funds and foreign investments for its economic progress. 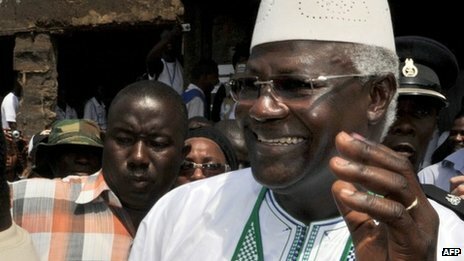 Cynics are curious as to what could have pushed president Koroma into a sudden decision not to travel to Washington to join his State House Chief of Staff – Richard Konteh and others, who will be meeting with the US Millennium Challenge Corporation (MCC) to discuss funding for Sierra Leone. The last meeting held with the MCC in Washington was less than satisfactory on the part of the president’s team of ministers – including the Chief of Staff. Is the president now suffering from ‘cold feet’ rather than a sprained ankle? It is understood from reliable sources that the president is less than happy with the dithering MCC, whom despite their earlier decision in 2012 to shortlist Sierra Leone as a possible recipient of MCC funding, are still unable to release funds believed to be close to $100 million. President Koroma met with the MCC just five months ago in Washington, and was expecting to return home with the cheque in his briefcase. It is understood that the main reason for president Koroma’s planned visit to the US this weekend, was predicated on the belief that the MCC has on this occasion finally decided to release the cheque. But the Sierra Leone Telegraph has learnt that this is not the case. Government ministers and officials are yet to make a convincing sales pitch to the MCC in Washington, about the need for the funding and precisely what the government will spend the money on. There are also other unanswered questions of transparency, probity and accountability, which needs to be resolved, as well as the presentation of a technically sound and evidence-based project proposal. Quite sensibly therefore, the president on this occasion, appears to have withdrawn his decision to travel to the US, rather than return to Freetown empty handed – second time around. It should be emphasized that each visit to the US by the president and his large entourage, is costing the poor taxpayer in Sierra Leone – hundreds of thousands of dollars. Surely, the question of value-for-money must also be raised. President Koroma delivered a speech at the offices of the World Bank in Freetown yesterday, the eve of what should have been his second visit to the MCC in Washington, in less than five months. “It is a great honour for me to speak on how we can harness the African Diaspora for African development. “The Diaspora is pivotal to the sustainability of the ongoing renaissance of Africa, and we thank the Constituency for Africa and the World Bank for organizing this most relevant meeting. “Topics relating to the Diaspora are dear to us, for the African Diaspora was very integral to the emergence of my country Sierra Leone, and our neighbour Liberia. “But the scramble for Africa in the 1880s put enormous strains on the idea and actualization of return of people of African descent to the continent. That scramble was an inglorious race amongst non-Africans for the resources of Africa. “The continent was carved up amongst European powers; political and economic marginalization, and a divide and rule policy by the colonialists prevented the optimizations of synergies between the Diaspora returnees to Sierra Leone and their compatriots. “But the resilience of the Diaspora returnees hardly waned. They moved all over West Africa, spreading knowledge, establishing centres of worship, founding newspapers, starting thriving businesses and forming alliances all over territories in the Gulf of Guinea to end colonial rule. “Too many events have been played out since that time. Africa regained its independence; but our economies stagnated. “Economic exploitation of the continent, mainly by non-Africans, and political repression of the people, mainly by their own very leaders created too many realms of deprivation in the continent. “But the 21st Century has brought in its wake a new beginning for the cradle of mankind. Within 10-20 years, Africa’s annual production value will be between USD 1.5 and 2.0 trillion. “The region has 80-90% of the world’s chromium and platinum group metals, 10% of its oil reserves of oil and 40% of its gold. Our continent also has some of the earth’s largest deposits of iron ore, uranium and copper. “Our common fatherland has approximately 600 million hectares of arable land suitable for cultivation, of which 15% of this land is developed. Per capita water resource is 4,600 square meters, and this is more than that in Asia. “The African story however, is not only about natural resources. A great revival is taking place in our telecommunications, retail, finance and other sectors. “More Africans are having more disposable incomes, the middle class is expanding, more than 60 million Africans have an income of $3,000 a year and this is increasing to more than 100 million Africans in a couple of years. “The Africa Development Bank now reports that over 350 million Africans, a third of the continent’s population, are in the middle class. “There are still many challenges in the continent. We are faced with huge infrastructure deficits and an image in the media, particularly in the West that is fixated on depicting Africa as a continent of conflicts and natural disasters. “This image is definitely not the narrative of Africa today. More than 90% of countries in Africa have stable democratic regimes at peace with themselves and their neighbours. “Democracy, political and economic stability are taking roots in the continent. Our economies are becoming more open, our societies more tolerant, and our budgets more balanced. “Our debt burdens have declined and we are reducing rates of inflation all over the continent. The results are greater growth rates than ever before. Six of the world’s ten fastest growing economies are in Africa, one of which is my country Sierra Leone. “Foreign Direct investments in the continent have increased more than six folds since 2007; and more than in almost all other regions of the world, we have better rates of return for enterprises that are establishing new marketing networks, new brands and innovative products. “Africa’s doing business rankings, transparency indicators and the number of companies in the race to invest in the continent is increasing. “Whilst there are some remaining challenges, we are, in Sierra Leone, as in many other countries in the continent, moving on to ensuring international best practices in our mineral acts and providing fiscal incentives for enterprises in mining, infrastructure, agribusiness, tourism, value addition and renewable energy. “More importantly, we should not allow this race to kill the noble idea of the return of the African Diaspora. “We have two distinct groups of Africans in the African Diaspora outside the continent. There are our people involuntarily moved out of the continent starting four to five hundred years ago and ending only about hundred plus some years ago. “A consciousness of return has always been strong amongst this group. It was a consciousness of a return to the state of liberty, a return to the assertion of economic, political and cultural freedom. “The other group of Africans in the Diaspora are more recent migrants to Europe, the Americas and in the last few decades to Australia and East Asia, particularly China. “Many of these migrants are amongst the most skilled and energetic of our people, and their emigration brought about enormous brain loss and skills gaps in many critical areas of our societies. “They often moved out to seek better opportunities, but most of them have often thought of their emigration as temporary, and that they would one day return to the continent with better skills and greater resources to uplift their families, communities and nations. “In essence, we may have, on balance, brain gain, more skills and resources for the African Community. But for this overall brain gain to register in the lives of the people of our continent, the idea and actualization of return must be kept alive, must be sustained and must be synergized. “But we must also note that this consciousness or commitment to return amongst both the voluntary and involuntary Diaspora had always faced enormous challenges. “The physical destination of the return, our continent, has for long been pilloried as a place unworthy; and freedom for our people, whether in Africa or here in America has a long history of being lambasted as an unworthy state for us. And we have often had to face criticism about the poor state of our economic enterprise and poorer state of our consumer markets. “But we have remained unbowed; and today an African renaissance is underway. We are the worthiest place for investment in the world; our consumer markets are growing; and the consciousness of return and the synergies for growth, dignity and freedom that this return could bring about are more robust. “The New Partnership for Africa’s Development (NEPAD) calls for the establishment of a reliable continental database to determine the magnitude of the problem of brain drain and promote cooperation between Africans abroad and those at home. “The World Bank too has been very instrumental in collaboration with African governments on Diaspora issues. In September, 2007, the Bank’s African Region launched the African Diaspora Program (ADP). “The program deals with Diaspora policy formulation and implementation, financing and leveraging of remittances for development and human capital utilization, through Diaspora professional networks and organizations and hometown associations. “African governments are fashioning policies for engaging and mobilizing both the voluntary and involuntary Diaspora and Sierra Leone, Ghana and Kenya have established units within their respective governments to oversee Diaspora affairs. “Remittances by Africans abroad are second only to foreign direct investment in terms of value of financial transfers and investments in the continent. 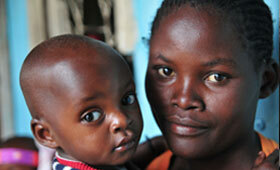 “In 2010, remittances from Sub-Saharan Africa were US$29 billion and the 2011 estimate was US$31 billion. The 2012 remittances forecast was US$31 billion and are predicted to increase to US$33 billion in 2013 while the forecast for 2014 is US $36 billion. “These remittances provide the much-needed finances for ensuring household security and alleviating poverty, improve access to formal financial sector services, and provide opportunity for family members to embark on self-financed projects and investments. “The African Diaspora, from Ghanaian doctors and nurses in Britain to Ethiopian medics and Sierra Leonean teachers here in the United States, is organizing pools of skilled personnel for interventions in the health and education sectors. “The African Diaspora has been pivotal in advocating for policies and actions beneficial to African peoples. During the armed conflict in Sierra Leone in the 1990s, the Diaspora was key in mobilizing support for peace and justice in our country. But these remittances and investments, these transfers of skills, this advocacy for the continent, need to be greatly structured and deepened to ensure optimal relevance to the social, political and economic renaissance of Africa and the African Diaspora. “We may need to map out the African Diaspora and create databases that capture the varying demographics, skills and other relevant statistics for effective designing and implementation of policies relating to the African Diaspora. “We may also want to look into the creation of a Pan-African Diaspora Commission charged with the responsibility of designing continent and Diaspora wide frameworks, engagement policies, programs and projects. “The African Union has commenced the process; we may therefore need to further engage the Union with a view to publicizing and mobilizing the necessary financial, human and logistical resources to ensure success. “We may, in view of this, want to create a Volunteer Diaspora Corps, similar to what we have in the Peace Corps, to design organize and implement schemes for Diaspora volunteering, transfer of skills, and experience sharing. “We may also need to revisit our citizenship and residency laws in ways that would optimize Diaspora participation in the political, social and economic revival of the continent. “We may also need to institute combinations of initiatives that amongst others, lower the costs of transactions between Africa and its Diaspora, and aggregate Diaspora remittances and investments for optimal impact. “This could be done, for example through preferential duty waivers and other concessions for Diaspora businesses; extension of formal banking opportunities and cheaper costs for financial transfers of members of the Diaspora, and the issuance of Diaspora bonds by African Governments. “It is estimated that African Governments could raise billions of dollars annually through Diaspora bonds for development programs in the continent. Kenya and Ethiopia have already commenced the issuance of Diaspora bonds. “With growing competition in the African banking sector, we may also want to design policies that encourage commercial banks to expand their business to the Diaspora population by sourcing deposits from them and offering them mortgages and other services. A few banks have started the process. “Expanding and strengthening these initiatives may allow the diaspora to hold money in local African banks, which gives the banks the ability to mobilize deposits for loans to the private sector for development. “We may also need to encourage the growth of private sector networks as effective means of establishing links to the diaspora. These may include investments in capital markets and modern communications technology, the establishment of investment funds, the creation of social media, and generation of literature, games and other cultural products that are informed by the memories and aspirations of our people. “We may need to strengthen cultural and intellectual exchanges between Africa and the Diaspora. This may include exchange programs between universities in Africa and historic African American institutions and the development of distance learning modules; organization of annual festivals involving the African Diaspora in the continent and the promotion of heritage tourism. “Distinguished ladies and gentlemen, Africa is on the move, and people of African descent, wherever they are, must be part of this revival. Harnessing the African Diaspora in building capacity in Africa is the only way we can sustain our revival. “Harnessing the African Diaspora in building capacity in Africa is the only way we can give practical relevance to the narrative of our common ancestry, our historic resilience, and our aspirations for a better world through a better Africa, an Africa that is strong, democratic, prosperous and a greater light on the peoples of the world. Perhaps should president Koroma succeed in mobilising Sierra Leonean diaspora investments, expertise and entrepreneurship, he may not need to go cap in hand to the MCC after all. But where is the policy and ACTION to achieve this, after six years in power?